I have this thing about… no wait, that’s not fair. I have a lot of “things” — like the one about not liking warm, oozy chocolate desserts, sugar rimmed drinks or those waxy cubes of cheese you always see at corporate catering events — but for today, let us just pretend that I have one, and that one is about passed hors d’œuvres and amuse bouches that are too cumbersome to be easily eaten, standing up at a party. Party foods should come in one-bite servings. How many times have you been at a wedding’s cocktail hour and you were somehow supposed to be eating something from a plate (cue your tiny violins, please) that was way too messy to be eaten while wearing a nice dress, carrying a cocktail and mingling with distant cousins? Wouldn’t this all work a little better if things were the size they should be? I think that is the genius — or one of the geniuses — behind these pecan sandies from Claudia Fleming’s Last Course, a cookbook I feel almost guilty about continually bringing up since I know it is out of print. 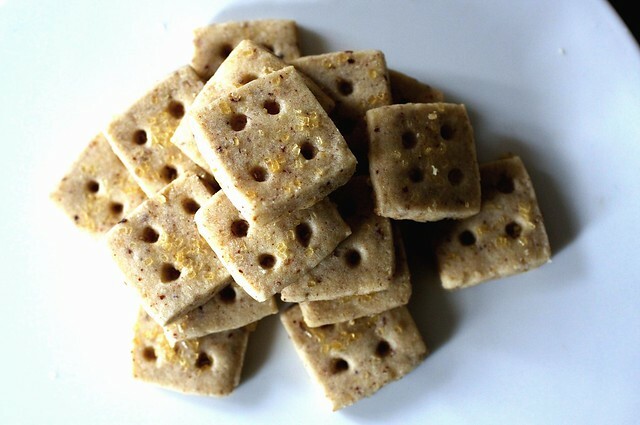 She suggests that you cut them into one-inch squares so that they can be bite-sized and I can’t tell you how much better this made them. No crumbs! No fuss! Such dainty little gifts. I made a batch of this dough in the beginning of the month, rolled them out, cut them into squares and froze them between sheets of waxed paper, wrapped in plastic, only baking them as I needed them. For a lunch with my old coworkers, I dipped them diagonally in melted bittersweet chocolate. To fill out a cookie box for a party, I sprinkled them with turbinado sugar. I imagine they’d also make great sandwich cookies, filled with a stiff chocolate ganache of your choice. Point is, you can make cookies like this well in advance and always have them on hand when life demands cookies. Which is, you know, often. Now, I know that the Internet isn’t exactly facing a shortage of recipes for pecan sandies, but I happen to think that these are a step above, due to the tiniest of steps: Fleming has you toast them until they’re very dark, which, combined with sugar, brings out an almost maple-y flavor. Once ground up, they give the cookies a whole other dimension — the pecan flavor is louder and the cookie tastes more grownup than what we might be used to. In the best way. Preheat the oven to 350 degrees F. Spread the nuts out in one layer on a baking sheet and bake them, stirring occasionally, until they are well browned, 10 to 13 minutes (they will smell toasted and nutty). Transfer the pan to a wire rack to cool. In a food processor, grind the nuts with 1/4 cup of the flour. Set aside. Using an electric mixer, beat the butter and sugar until creamy and smooth, about 2 minutes. Add the vanilla and beat well. Sift together the remaining 1 3/4 cups of flour, the salt, and the baking powder, and add it to the dough, mixing until just combined. Stir in the nut mixture. Form the dough into a disk, wrap in plastic wrap, and chill for at least 3 hours. Preheat the oven to 325 degrees F. Roll the dough between two sheets of wax paper to 3/16 inch thick (a rectangle approximately 10 x 14 inches). Using a sharp knife, cut the dough into 1-inch squares, then cut the squares on a diagonal into triangles (I skipped the last cut into triangles). Sprinkle the cookies with the turbinado sugar. Place them 1 inch apart on ungreased cookie sheets (do not reroll the scraps). Prick the cookies with a fork and bake until pale golden all over, about 10 to 12 minutes. Cool on a wire rack. these look amazing! And you’re right – they should be bite sized so these are perfect! I love bite sized. I can eat twenty and then tell myself that they would really only make up, like, two cookies and what’s the harm in two? I swear those cookies are talking to me. 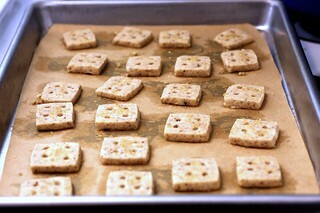 How creative to make square cookies.I’ll have to give it a go. wait — 12 dozen?? as in 144 cookies? by the way, i have 3 nuts left in the jar. i have zero will power – thank you for them. These are so cute! They look really yummy. I left the sugar off, no harm at all. I’m making these for the party on Saturday night! Wow, gorgeous. I agree; single bite sized only at cocktail parties. Some munchy cookies too for anytime..like these. I made these cute little shortbread cookies filled with sprinkles that were cut into 166 (each) of 1/2 inch pieces from a 5X8 slab of dough. They were so cute in my candy jar over Christmas and everyone loved dipping out a handful as if they were peanuts! These one-inchers are almost as grabby. Thanks, Deb, I like the toasted ground nuts in these too. I agree. Besides, these are too cute for words! I love the presentation of this classic cookie. No one would turn down a tasty morsel of this little beauty! I really like the way the raw sugar looks on top. They almost look like little crackers! These look wonderful! I just made the espresso chocolate shortbread cookies you posted last year, and once again loved the “rolling out in the bag” trick – I imagine it would work for these, too! ………………….but doesn’t your recipe say to cut the squares into triangles…….? Your photos have me sold! I’m going to make these cookies w/tweaks for sugar-free and gluten-free. The way you cut them is absolutely adorable, Deb. These look so darling. I can’t wait to try these out for New Years. The trouble with reading your site, Deb, is that I want to make everything I see. I already have some cookie dough in the fridge (the 1942 honey refrigerator cookie from Gourmet’s favorite cookis through the years thingy on their website) waiting to be baked tonight for a party tomorrow and NOW I want to make these TOO. Sigh. Anyway, they’re adorable. Happy New Year! They look divine. I’ve been a quiet observer of your blog and think your photos, writing and food are all wonderful. Have a fab 2009! My co-workers and I just love your blog! We drool over your pictures and recipes practically every day. Your step by step breakdown and critiques are very helpful too. Thanks so much and have a happy new year!!!! These are lovely mignardise, the dessert equivalent of an amuse-bouche. Just one little delicious bite. Also the name of my blog. I hope to try them out soon! I have this thing about your blog. It’s not to be missed. I’m looking forward to making these. Judith — I forgot to mention that the original recipe suggests that you then cut these squares on the diagonal into triangles, but I drew the line there. I am sure they would be even cuter. Yum Yum, I don’t have any pecans but walnut would be good too. Or Hickory nuts. Mmm, I am a Sandies fanatic. These look spectacular! I’ve loved Pecan Sandies since my grandmother introduced me to them when I was little. One question: What if I don’t own a food processor? How to grind the nuts? I have a nice blender, would that work? I’m not afraid of manual labor, either, if you have a good method. I’m totally making these for our Winter Formal cocktail party next month. Especially since the dough can be made ahead. How long would you say the cookies are good AFTER you’ve baked them? Can I get away with baking them a couple of days in advance? Any thoughts on using a pizza cutter for the slicing instead of a knife? I don’t have the steadiest hands and I just know my little squares will look more like little trapezoids if I do this with a paring knife. These are so cute. They remind me of blocks, or legos, two of my favorite childhood toys! Oh right and I’m sure they taste amazing too. Just wanted to say that I made the rainbow cookies for my italian family and they were much loved. Everyone thought they were great and at least four people admitted that they’d been forcing bad versions of these cookies down for years, but really liked them this time! I’d never heard of Pecan Sandies before, but these looked so adorable I had to try them. As I had no pecans I substituted walnuts. I’ve just gobbled up a dozen: they are delicious, and surprisingly rich. Thank you so much for the recipe! The dough should keep for a few days wrapped up in plastic wrap in the fridge, shouldn’t it? (I’ve no freezer space). I want to try them half-covered in chocolate as per your photo. Are there tricks to getting that right, or does one just melt choc and dip? I completely agree with you about the hors d’oeuvres – there should be no plate required. These cookies look fantastic – the photos on your blog are heavenly! Hi Helen — Walnuts are actually my favorite, so I’m sure I’d love those. The dough should keep for a few days in the fridge, longer in the freezer, if you had space. Soo… the best way to dip them in chocolate is to temper it, which will give the chocolate a shiny firm coat. I didn’t do it on those (just melted the chocolate and dipped) and they came out a little grainy (but tasted fine) but probably would next time. Tempering (in case you don’t already know) is a little tricky but if you have a good, quick-read thermometer you can pull it off… I like Jen’s instructions here. How do you get such neat squares? Oh, yum. This recipe is perfect for veganization since there are already no eggs! It also looks like it would halve beautifully; do you think that would affect the chilling time? Alphie — I, um, used a ruler. Amber — The idea is to chill it long enough so that it is very firm, and will roll out nicely. It may vary depending on ingredients and of course the temp of your fridge. I just called. Sadly, they are all sold out. I’ll bet these would be equally as good with hazelnuts. mmmmmmm. Deb, These look fabulous, as does just about everything you put up! Did you skewer them into fourths just to make them look cuter or was that in lieu of the fork pricks? Thanks for another recipe to add to my ever-growing google doc full of yours! Both — in lieu of the fork marks and in a pattern that I thought would be cute. And also because I’m nearly incapable of doing anything “scattered” or “random”. It’s an affliction, I know. Are you kidding? No warm chocolate yummy desserts? No sugar rimmed coktails? I live for both …. These cookies look terrific, but I can’t get over the DONT’s…. I’m sure people identify with you often but today, encouraged by a desire to know how it all started with your Alex (who sounds as charmingly perfect as my beau) I located the old archives of Smitten… I can’t stop reading, even if it is not-so-ancient history! Very similar paths indeed. Keep up the good work, I always love your recipes. Hmmmmm.. I can’t have pecans, but I can have almonds. I think I’ll try the recipe with toasted almonds. Are these missing an egg or something? I made the dough last night and it seemed a little dry, but refrigerated it anyway and this morning it is a crumbly mess. Nevermind- once the dough warmed up a bit it stuck together. They smell good! These are actually a work of art. They almost (and I did say almost) look too good to eat! Yum with a warm cup of hot chocolate or coffee. I love the trick with the skewer. The dots/impressions make a great visual…impression! One, these look delicious, and I can’t wait to make them! Two, Smitten Kitchen is nominated for best home cooking blog over at Apartment Therapy: The Kitchen (http://www.thekitchn.com/) so head over and vote for Deb if you haven’t already! These look great. Thanks for another great thing to try. Hi M — Yes, the dough is a bit dry, but that dryness is what gives it its sandy texture. Glad you worked it out. I made mine with walnuts, and I also chose not to use a food processor ( my husband works graveyard, and loud machines for crunching nuts are absolutely out of the question while he’s asleep.) If you’ve got a sturdy table, a rolling pin, a ziploc bag and some time, you can put the nuts/flour in the bag and roll them on your sturdy table until they’re finely ground. It does take a great deal of time and horse power, but it works if you haven’t a food processor or coffee grinder. The first shortbread I’ve ever made, and it turned out amazingly! Much better than those rock-like storebought things. Just made these and the dough was a little crumbly. Really be accurate with the measurements!!! I over floured something! I made these with walnuts insstead of pecans, and they were terrific! Buttery and rich. Mine were not as square as yours, and I did use the skewer to dock the dough because I really liked how yours looked, but I cannot do anything to perfection and always end up with a whimsical look. Neither my picture or my cookies are as perfect as yours, but the taste was fantastic. Here’s a link to a poto of my walnut sandies. I`m really excited to make these. Thank you for posting the recipe! Deb, you never fail us! These were AMAZING! My new favorite cookie. Thank you! These look absolutely adorable! Pecan sandies are one of my favorite cookies, so I can’t wait to try out this recipe! Thanks for sharing! I can’t agree with you more! Party food should always be bite sized! So many times I’ve turned down appetizers because I can’t fit them in my mouth in one bite. These pecan sandies look delish! I’m going to have to make them!!! Every fall my mother sends me a care package from Georgia of fresh pecans. Considering the dry,stale things on my island sell for $15.98/lb in the bulk section of my local island grocer, I embrace them and savor them like precious contraband. Though, I now know some of these yummy morsels will be making their way into your pecan sandies recipe. Thank you kindly. I bought pecan sandies at a small bakery in Roslyn, NY – they were so delicate and tasty, so when I got home I had to search for a recipe. I made these yesterday. The bakery cookies were yummy, but these are even better. I am forwarding the recipe link to all my friends. 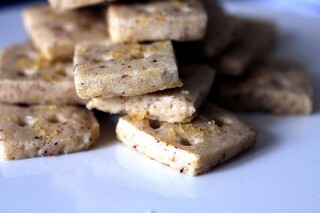 I just made these with almonds (that is all I had and I was desperate to try them!) They were amazing! I made these last night. DELICIOUS and easy. Thanks for the inspiration! My recipe made about 90 1 inch squares and a few scraps that were gobbled up, too! Quick question… I don’t have a food processor or coffee grinder at home, but I do have pecan meal. Can I substitute this for the fresh ground pecans? Also, if I substitute the pecan meal, would I still need to add the 1/4 cup of flour? Yes. An equal weight of pecan meal should be fine. I would not skip the flour. I make sandies for my grandmother whenever she remembers the cookies of her youth in Pakistan, naan kathai, an egg-less cookie with ghee and cardamom. This was the best recipe yet for pecan sandies, thank for posting it! I’m still wondering what’s wrong with warm, oozy chocolate desserts? Just not my taste? I like my chocolate desserts cold. The “Last Course” cookbook is now on sale at their restaurants website for $50! It goes for several hundred on Amazon, so quite a deal. YEah! I highly recommend dipping these in bittersweet chocolate as well, even if you don’t succeed in the tempering (I didn’t). They are soooo delicious. oh HOLY COW! These are scrumptious! I made them per recipe and mmmmmmm….. definitely will go in the recipe diary! Much thanks Deb, Keep them coming please! And you photographs are the real pushers for trying the recipe out. Such cute cookies! Hi! These cookies look amaaazing. I was just wondering if it would be possible to substitute the confectioners’ sugar with regular caster sugar, or even maple sugar? Will that greatly affect the texture of the cookies? These look amazing! I just put together the dough today for another one of your cookies – the Punishments. I note that there you recommended using a food processor because it gave the appropriate granularity to the cook (grain-like texture). I’m wondering if these, too, wouldn’t benefit from using the food processor instead of an electric blender? I Loooooved this recipe! so crumbly, flaky, buttery, and delicious little things! It was not sweet enough for my father though, so I am going to add a bit more it goes great with tea! I even melted some chocolate and made a sandwich! I am going to be making these as part of my southern style wedding favors! (georgia). cutest design too! You said not to reroll the scraps. Why is that? Does that apply to other cookie doughs? I’m fairly new to baking cookies and it’s something I would do if you hadn’t mention it. Hi Jin — Actually, I think I rerolled them anyway. That said, if you cut them into squares as I did, you shouldn’t need to. The more cookies get rerolled, the more flour they pick up and the less tender they end up — I think that’s the only reason Fleming warned against it. I just made these with locally-grown pecans. Delicious. Nice recipe, Deb. My aunt has a similar recipe and I know first hand how delicious they are. She also garnish with a dab of cinnamon. Hi! I just wanted to let you know that I am including these in a 25 days of Christmas cookies and bars post at mommy’s sweet confessions. They are beautiful! I just made these cookies and loved the taste and texture, but had a really really hard time rolling out the dough. My dough was in the fridge for 3 hours, and got soft and sticky super fast as I was trying to roll them out. Did you use a lot of flour to roll out the dough between the parchment paper? I didn’t add much flour, and wound up scrambling to cut out the dough into squares and had a hard time lifting them onto the baking trays. In the oven my cookies turned into small blobs instead of the beautiful squares you have. I’m going to try to make this again b/c i love the taste and texture, so any tips with the rolling and cutting aspect is appreciated! The only other things I can think of that might have gone wrong is that I halved the recipe, and my pecans were ground almost into a paste consistency. Thanks for any help you can provide! Beverly — Your kitchen might just be extra warm — I always put them back in the freezer for a minute here or there if they’re softening too quickly. However, the fact that they lost their shape in the oven sounds to me like you may be correct about it being due to it turning to paste. 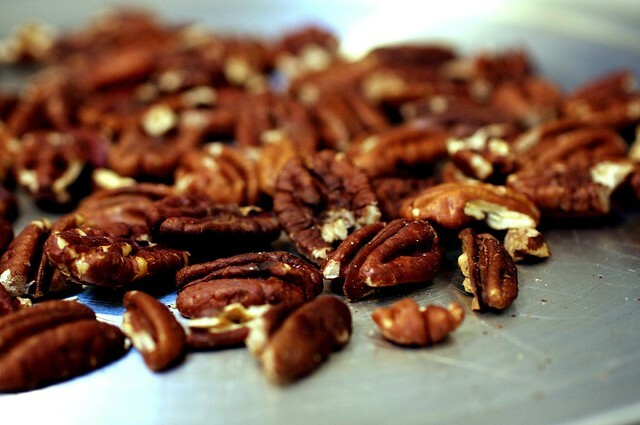 Paste means that the pecans released their oils, too much oil at the outset can lead to that impossible softness and spreading. Hope that helps for next time. Can you please provide weighted measurements for this recipe? Thanks! Thank you for the gram measurements! Your are wonderful and I love your blog. For those who like to bake with a scale, 1-3/4 cup flour weighs 219g while the 1/4 cup weighs 31 grams. Feedback from my own warm kitchen…these cookies are pure Christmas bliss. Sift in a picturesque snow fall, mix with carols on the radio, and life is simple and good again! Thanks for sharing this gem! Deb, I left my dough in the fridge overnight and it got super hard. Waiting for it to defrost a bit before i roll it out but was this also your experience? Any ideas? I’ve made these before and they were delightful but I can’t remember if i had the same issue last time. Thanks for all your amazing work!You’re a true reference for so many people!! Maria — As it warms up, it will soften. I just roll it anyway while still hard, gentle motions; cracking comes from rolling it too firmly, flattening it too fast. I love these cookies, have made them many times exactly as written with fabulous results. Recently determined that my life is markedly better without gluten. I wanted to share my experience with making them gluten free. Instead of 2 cups of all purpose flour, I used 1.5 cups of oat flour and 1/2 cup of fine brown rice flour and a tablespoon of tapioca starch. The dough is very, very loose. Firmed up after an overnight in the fridge, but became too soft to roll out very quickly. I used a mounded half teaspoon of dough rolled into a ball and flattened with a fork slightly. The cookies do spread just a touch, so you want to space them a bit more than normal. They are very delicate (be careful moving the cookies to a cooling rack, they have a tendency to break) and taste similar to the original. A little reminiscent of a digestive. I then put 4 Ghirardelli 60% bittersweet chocolate chips clustered together in a 4-square on a parchment lined cookie sheet, popped the pan in the oven to soften the chocolate, then gently pressed the cookies onto each 4-square to coated the bottom in chocolate. I am hoping that the chocolate reinforces the cookies a bit and makes them strong enough to withstand shipping. We shall see. When I make these again I will likely not use the brown rice flour, go all oat, and will likely add 1/2 teaspoon of xanthan gum. I think that will help make them less delicate. I made these and they were the best pecan cookies I ever made. Perfect texture. Perfect taste. I did make one change, though – instead of sprinkling them with sugar, I brushed them with maple syrup as soon as they came out of the oven. Perfect! Did you use a chopstick to make the holes in the cookies? Or a wooden fork? Those are not metal fork tine prints, and I like the look of what you used. LouiseL — I’m pretty sure it was the back of a wooden skewer, the kind that comes in big packs. Hope that helps. It yields 144 cookies? When you cut them into squares or into triangles? I was thinking about giving them out as christmas gifts (dipped in a little chocolate, ñum!) so knowing the amount of cookies would be a lot of help. Ok first of all this is an amazing dough. I won’t tell anyone in real life that I ate a good portion raw. The other thing was it took a lot longer than 12 mins to bake. I baked it closer to 16 and they are still delicate. Who cares though? They are incredible! 1) I shape it into round logs, freeze or chill, and slice into little rounds. 2) I skip the sugar and brush them with maple syrup as soon as they’re out of the oven. Here it is 2016 and this is still my favorite cookie recipe. Just made another batch. Now, thanks to Dorie Greenspan, I have smartened my process: Measure a 10″ x 14″ rectangle on a piece of parchment. Make dough. Spread onto a second piece of parchment and place the one with drawn shape on top (ink/pencil side up!). Roll the dough and inside to roughly match the rectangle. Place all on a cookie sheet and refrigerate overnight. Pull of top sheet. 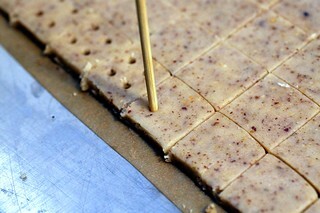 Trim, Cut, prick, sprinkle squares. Put 1″ squares on another cookie sheet and bake. Put unused squares back in fridge while baking. Deb, I’m lucky enough to own that Claudia Fleming/Melissa Clark cookbook and have made some of the most delicious recipes from it. Last Sunday, in spite of the fact that the house was filthy and the laundry unwashed, I decided to make the chocolate biscotti with pistachios and sour cherries (page 227). I will leave the actual process to your imagination (novice baker, tar-like dough, wet hands required for shaping, dark chocolate everywhere). I foolishly thought those 2-inch logs I worked so hard to form would actually stay in shape while baking. The worst part was trying to slice through whole pistachios and gooey cherries. I ended up reforming small pieces into about 4 dozen hideous-looking biscotti, and baked them for the second time. They were the best thing I ever ate. I had spent so much money on the ingredients that I could NOT give up (cheap Yankee talking). In retrospect, I think I’d just pour boiling water over the dried cherries and then drain after a minute or two, instead of simmering them in a pot. The biscotti were the only thing I’ve ever had stick (like glue) to parchment paper, and I’m blaming the cherries 🍒. The biscotti were an expensive nightmare that made me cry – yes, I’ll make them again. I got your note this morning. :) Thanks for the heads-up, although this has had the opposite effect: I really want to make them now. I’ll let you know how it goes and see if I could offer some tips/hacks for next time. Will be baking these this week. Just curious – why shouldn’t you re-roll the scraps? Why not reroll the scraps? I’m sure I did, but I guess in the original recipe Fleming told us not to. They will get more dry and look more misshapen when baked, I’ve found, but are otherwise harmless for snacking. I made these for a friend who loves pecans, and wow, they are incredible. I followed the recipe exactly, but took the advice of another comment to roll the dough into a log and do slice and bake. Absolutely delicious, and a new favorite in our house. I made these yesterday I used a one-and-a-half inch round cutter, and put two holes in the middle of each with the blunt end of a small bamboo skewer. I halved the recipe, rolled the dough between two sheets of parchment to about a 3/16th thickness with no regard to shape. I put the rolled dough out on the cold porch for 45 minutes and was able to quickly cut the rounds and put them on cookie sheets which went back into the cold for about 20 minutes. I re-rolled the scraps, chilled and then cut. I got four dozen lovely cookies, and it took less than two hours from start to finish. They are delicious, and were an instant hit with family and co-workers. I suspect I will be making them again next year, if not before. Delicious! I noticed that they browned better on the bottom when I baked them directly on the baking sheet instead of on parchment. Also, after the three-hour refrigerated rest, it took a while for the dough to be soft enough to roll. Just making these good looking cookies now. Used half recipe amount and 1/4 cup oil in place of butter. Mmmmmmmmmm. Hands down this is the best recipe for Pecan Shortbread! After mixing the dough I roll it out between plastic wrap, fold in the ends of the plastic wrap so dough doesn’t dry out, put on cookie sheet and place in refrigerator for 45 minutes until firm. Then I cut them up and bake. These are simply amazing! First time making sandies and they were perfect. I didn’t bother rolling them out, just thin sliced off the cold disk and didn’t worry about uniform squares. Worked great. After baking, how long will these keep? My two “batches”/disks are in the refrigerator now. For anyone else thinking, Deb, you cannot possibly want me to get my food processor and mixer dirty for a simple cookie, it works fine all in the food processor. Grind the nuts and flour. Transfer to a bowl, but do not bother to clean out the work bowl. It took a few rounds of scraping down the bowl to work the butter and sugar together. I also just pulsed in the flour mixture so it would not get tough. Worked perfectly! Has anyone tried these with pistachios? I have the same question! I think if we don’t hear back, I’ll give it a try and let you know! I found the dough was too crumbly to work with. I guess I didn’t mix them long enough? 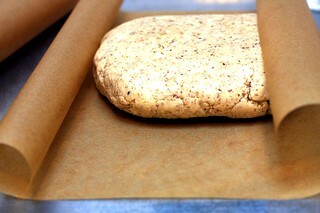 I had to roll them with waxed paper tight up against the sides to stop the dough from falling apart. I would have found it useful for you to show the mixed dough at each stage – before mixing in the nuts and after mixing in the nuts. They were delicious!! !